Fall is by far my favorite time of the year. The air turns cool and crisp, the leaves start to change, pumpkins and mums are available and everyone seems to fall into a more relaxed state of mind. 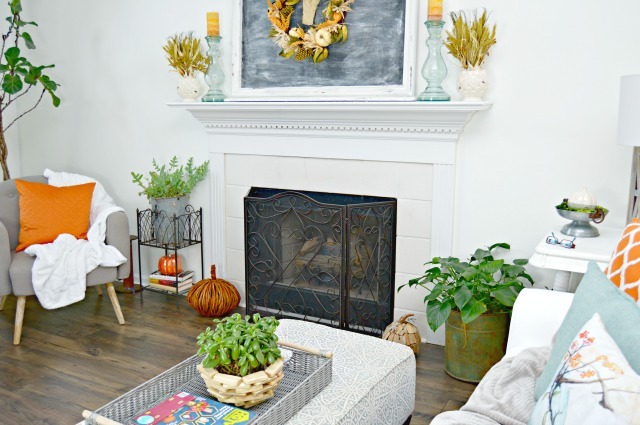 I love changing up our small living room when the seasons change, and fall is definitely my favorite time to decorate our little space. 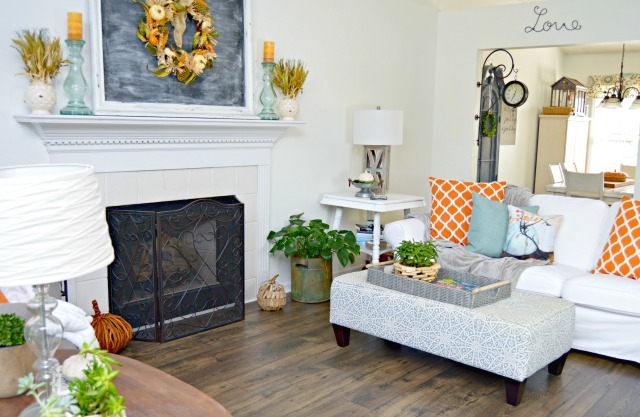 Come take a look at some of simple ways to add a little fall home decor on a budget! I don’t know about you, but I love color. While my furniture and walls stay pretty neutral to help our small space seem larger, I love to add pops of color…it just makes me happy. I recently teamed up with At Home to decorate my space using some of their amazing products without breaking the bank, and I’m so excited to share my finds with you. I have to say, I decorated our mantel for Christmas using At Home items last year, and I’ve been a HUGE fan since then! You can find my Christmas Mantel from 2015 HERE! 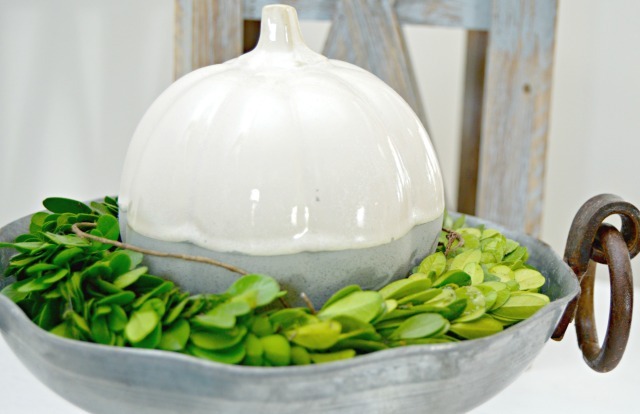 I want to say something before we get started here…not all decor has to be season specific. 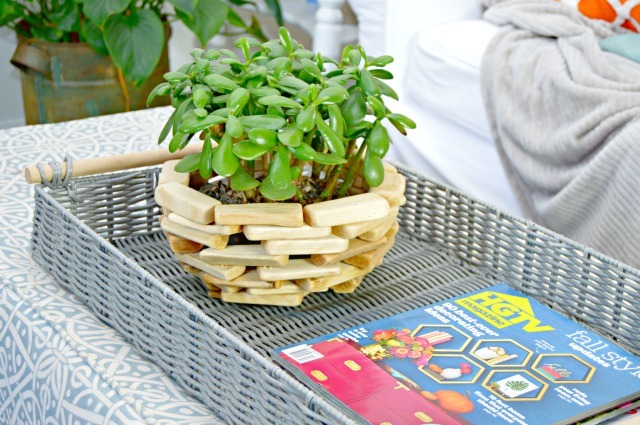 One of the first things I found at At Home was this gorgeous and inexpensive driftwood planter. It was perfect for either a mum or indoor houseplant, and I will be able to use it all year round. I placed it in a pretty tray along with my fall magazines on our ottoman and it’s now one of my favorite pieces! 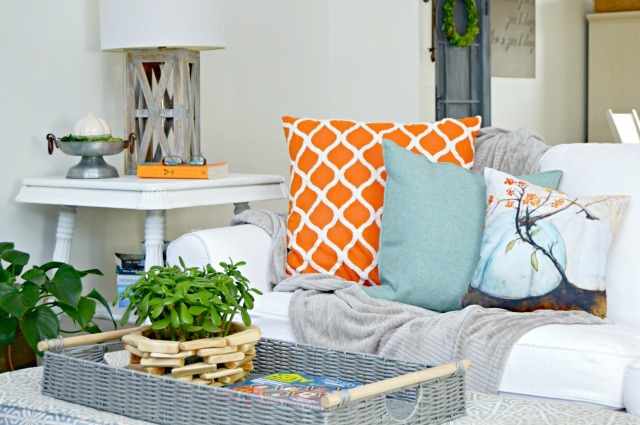 I knew I wanted to add a pop of color to our white slip covered couch, so when I spotted these orange moroccan patterned pillows, I knew they would be perfect paired with an aqua pillow I found and a pillow that was designed by my friend Lucy from Craftberry Bush. I also added a soft throw. This is my favorite spot for settling in with a book. At Home has a HUGE selection of throw pillows in every color imaginable…I may have snagged a few on clearance to use next spring. I should mention that this is also Nash’s favorite spot for napping and cuddle time. He’s so cute, I just can’t tell him no. Spanning around a bit, you can get a little peek at our mantel. 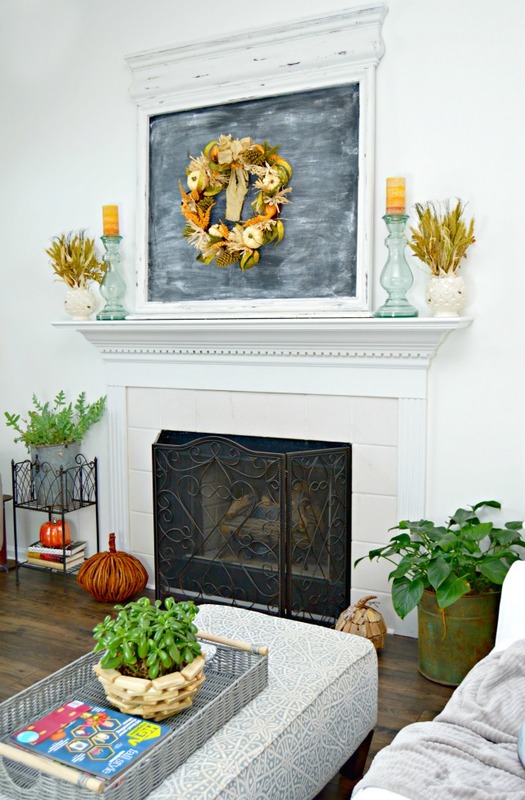 I made the large chalkboard from an old dresser mirror years ago, and it’s the perfect background to hang a wreath. I flanked our fireplace with a jute pumpkin and a small driftwood pumpkin along with a couple of plants. I love plants so much and have several in every room of our home. 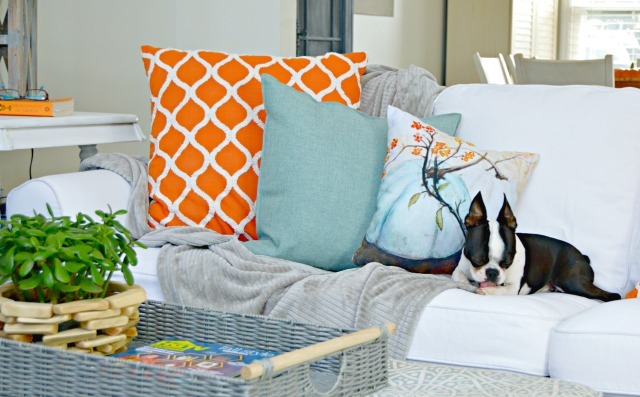 I added a smaller orange throw pillow to my grey chair along with a soft white blanket. This is Kate’s favorite spot to have her hot chocolate in the evenings. 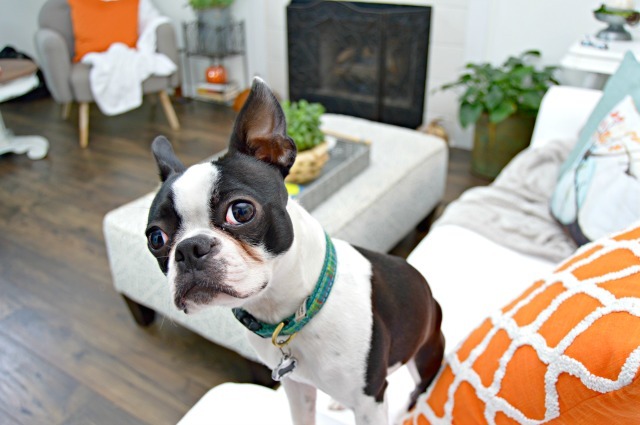 Here is a little close up of our mantel…isn’t she cute? When I found this beautiful, nature inspired wreath in the At Home wreath section (which is super nice and has a big selection), I knew it would be perfect on the chalkboard background. I added a couple of wheat arrangements to each side and some ombre candles that we love to light in the evening…it’s just so cozy! 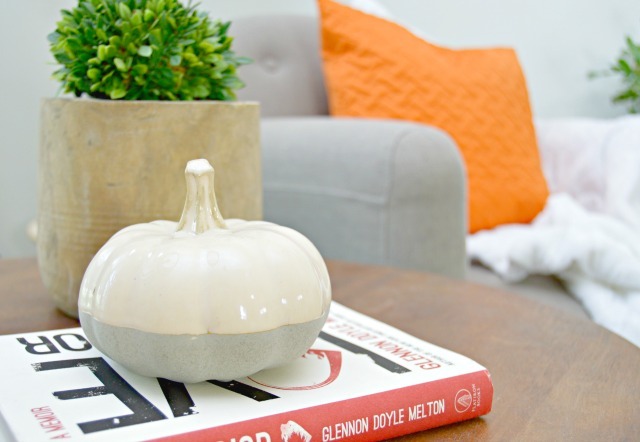 At Home also had these adorable concrete dipped pumpkins that I had to have. I sprinkled them in various spots around the room. So cute, right? I am truly impressed with At Home’s prices and GIGANTIC selection of home goods and decor. 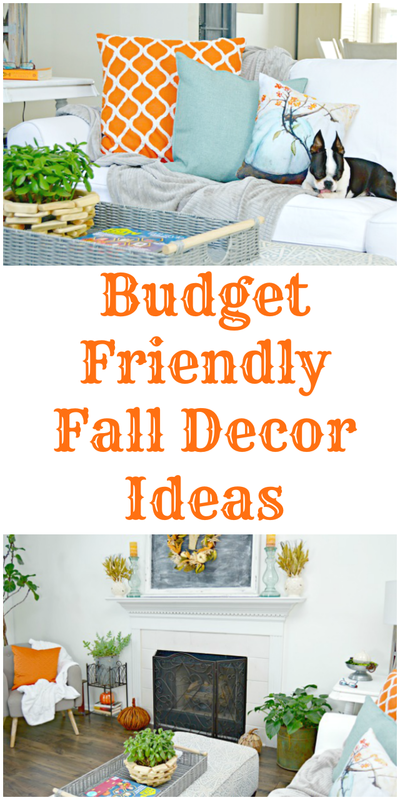 Their fall seasonal section had me aching to decorate every room in our home, and at their prices, I just may do that! The great thing is…they have everything you could possibly imagine for your home. They have indoor and outdoor furniture for every room, rugs in every size you can imagine, pillows, bedding, candles, floral stems and arrangements, wall art, kitchen ware and so much more. They literally get in over 500 new items each week! I’m already looking forward to going back for cute Christmas decor! And just in case you needed a little more cuteness to get you through the day…Nash is wondering why I keep snapping pictures and won’t just let him nap on “his” couch. Did you say pillows & throws? You know that’s my language. I’ll have to check them out!! And Nash goes with everything ???? Just what I needed to get myself in gear for fall!! Such a beautiful post.